The accident took place in Petaling Jaya on Wednesday, 14 November. 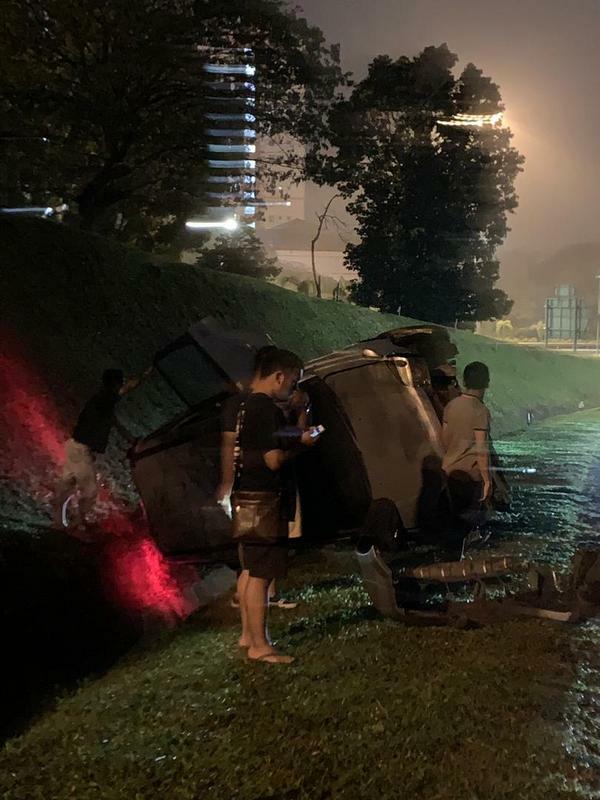 On Wednesday, 14 November, Malaysian singer Talitha Tan noticed a car overturned and crashed into the side of the road before the Damansara toll. "Guys, please drive safe. Cause last night I came across this car that under-steered and crashed. The guy was fine. But there I was, not knowing who to call. 911? 999? HAHA. No It's 112!" she wrote. 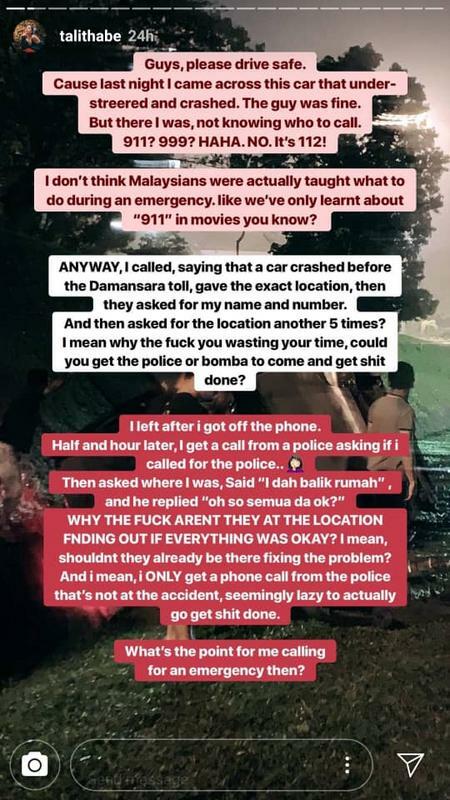 "I don't think Malaysians were actually taught what to do during an emergency. Like we've only learnt about '911' in movies you know?" She wrote that he had asked for the location of the accident not once or twice, but five times. "Half an hour later, I get a call from the police asking if I called the police," Tan added. When the police asked her where she was, Tan replied that she had gone home assuming that they had already went to help the man. But, the police then asked her, "Oh so semua dah ok?" (Oh, so all good then?). 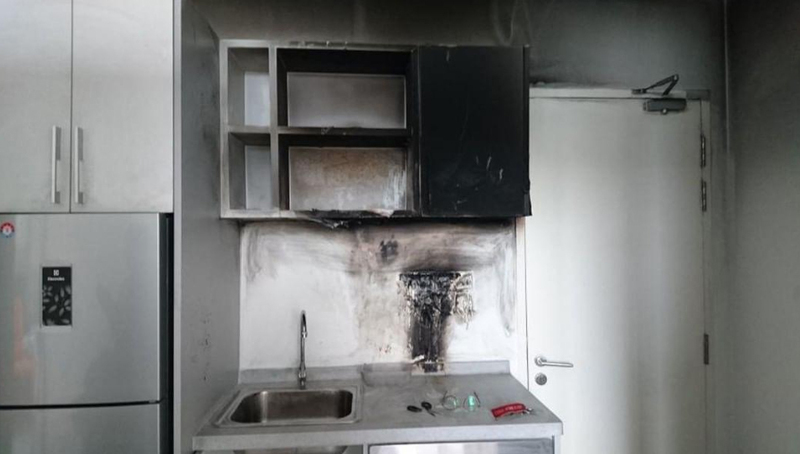 A person, who preferred to not be named, revealed that she once called 999 when her kitchen caught fire. "[They] told me to calm down and [took] my location [down] and hung up." 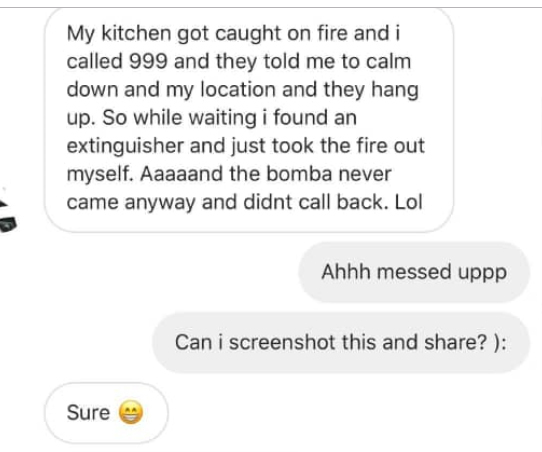 The person had to eventually put out the fire herself because the bomba never showed up or returned her call. The ambulance told her family that they could not find their house and asked if they [the family] could transport her dad to their location instead, which was a few kilometres away. 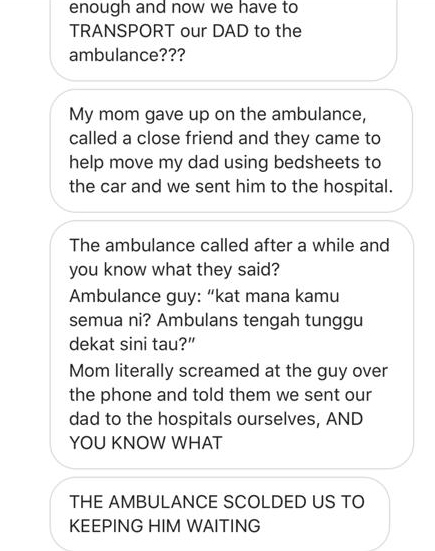 "My mom gave up on the ambulance, called a close friend, and they came to help move my dad using bed sheets to the car and sent him to the hospital," she wrote. 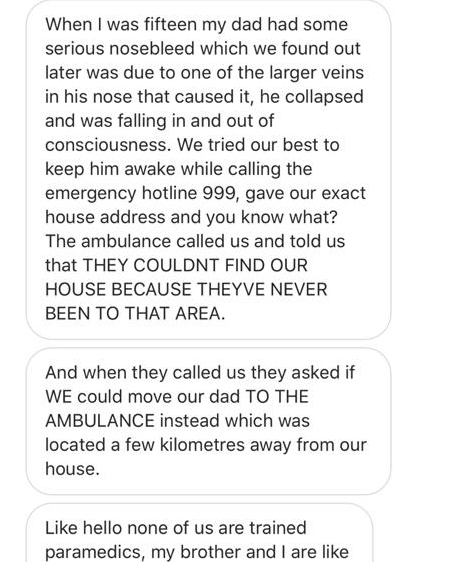 She added that the ambulance later told told them off for "keeping them waiting". In 2015, The Star reported the MERS 999 project director Rozinah Anas as saying that 112 was an alternative contact that can only be dialled from a mobile phone. She added that all 112 calls would be redirected to the 999 Response Centres. However, both numbers will not work on mobile phones without an active SIM card. 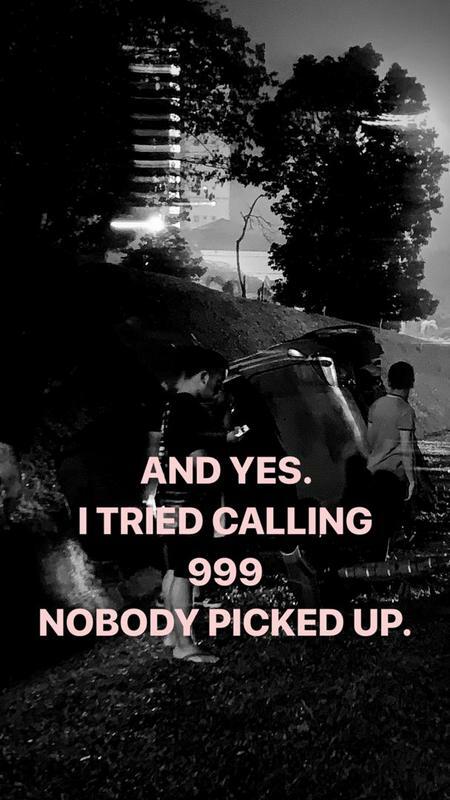 999 - This emergency hotline will connect you with the police, Fire and Rescue Department, ambulance services, Health Ministry, Civil Defence Department, and Malaysian Maritime Enforcement Agency. 112 - This emergency hotline can only be dialled using mobile phones and will redirect your call to 999. It can be used to contact police, fire brigade, and ambulance services.